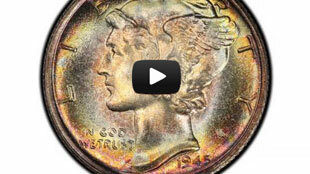 Is Coin Collecting Ready for Prime Time? We are giving away a FREE Columbus Proof Commemorative Silver Dollar in a Special PCGS Holder with a Retail value of $75 to one of our readers. The Winner is Martin Bell from New York. If you are the winner please send us an email to claim your prize. All winners need to have an active subscription to the PCGS eZine Collector to be eligible for the prize drawing. The winner needs to claim their prize through email or by calling PCGS no later than 30 days from the date in which you were notified by PCGS or forfeit the prize. Since the 20th Anniversary of the American Silver Eagle in 2006, the Mint has started to introduce more and more special release Silver Eagle series. It was just announced they plan to celebrate the 25th anniversary of the West Point Mint with a two coin set. What do you think of these special issues? The 1953-S Franklin Half Dollar with Full Bell Line characteristics is the key coin to the entire circulation strike Franklin Half Dollar series. Okay, that was a lie. Every year about this time, I begin adding modern world coins from the previous year to the set composites in the PCGS Set Registry. I’m working on 2012 coinage now. One would think this would be a somewhat easy process, and for some countries, it is. Not so with Canadian coins. For a number of years, the Royal Canadian Mint has produced large numbers of commemorative issues. On June 7, 2001 the U.S. Mint made the 2001-D Buffalo Commemorative Dollars available to the public for the first time. Immediately upon the first day of sales, the U.S. Mint was flooded with phone calls, and collectors who were unable to get through the phone lines had no choice but to purchase the coins in the aftermarket at a very high premium. Talk about an under-appreciated series. The silver-clad Kennedy half dollar has always played second fiddle to its one-off 1964 and 1964-D 90% silver counterparts. In 2013, PCGS will host seven shows in Las Vegas, NV. The host hotel will be either Bellagio or The Venetian|ThePalazzo. Review the dates now to see which shows you will attend. LAS VEGAS – The Legend-Morphy team is once again off to Las Vegas to conduct a world-class rare coin auction in association with the PCGS Members Only Show. © 2013 PCGS, Inc. A Division of Collectors Universe. All Rights Reserved.